It’s been quite some time since I last drove a brand new Nissan Micra, 6 years in fact. So you can hardly blame me if I can’t recall most of what I then wrote about it. It was super-charged as I recall; the engine was great in fact, the definite standout feature. As for the rest of it…The truth is, it was pretty forgettable. It would appear that I wasn’t the only one who thought the last generation Micra (the perhaps unfortunately named K13) a tad lacklustre. In 2003 Nissan hit peak Micra sales when it launched the third generation K12: 171,000 Micras were sold that year. In 2013, by which time product-ion had moved from Sunderland to India and the Far-East, sales of the fourth generation K13 struggled to top 50,000. The Micra dropped out of the top-ten best-sellers list, and out of people’s minds. Even the loyalist of Micra fans began looking elsewhere. 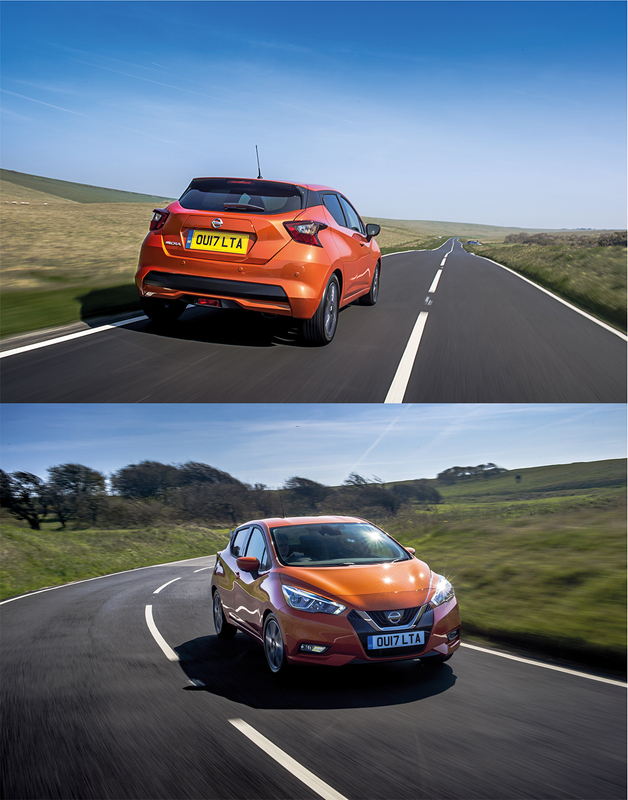 What you see here is the all-new fifth generation Micra. It’s now made in France, alongside the Renault Clio incidentally (with which it bears quite a resemblance, and more than a few oily bits). It’s been designed with the intention to win back that lost market share, compete directly with the likes of the Ford Fiesta and Volkswagen’s Polo – not to mention a host of other very capable supermini offerings from manufacturers most of us had never even heard of when the original Micra first put in an appearance way back 1983 – and once again become a best-seller. The question is: Is it good enough? Well, it’s certainly stylish enough. Whereas not so long ago the Micra’s styling could be considered more amorphous (well, almost) than it could auto motive, it’s now altogether more eye-catching. You might even go as far as to say that its new sharply creased and swoopy styled five-door only body is sporty. I know, a Nissan Micra, sporty! Whatever next? Looks can of course be deceptive. And it’s fair to say that whichever choice of the three available engines you pick: 3 cylinder 1.litre 71 bhp petrol, 3 cylinder 0.9litre 89bhp petrol turbo, or 4 cylinder 1.5 litre 90 bhp diesel, performance is altogether more modest than it is mind-blowing. Our 89 bhp 3 pot’s official 0-62mph time is a near calendar-worthy 12.1 seconds. But at least say Nissan, it’ll do 61.4 mpg whilst emitting just 104g/km of the dreaded CO2. In reality things feels faster than those figures suggest, and it’s actually quite fun to rev this little engine all the way round to the limiter – of course you won’t get those fuel figures if you do! Out here in the hills we got mid-high forties mpg and noticed, that although always eager, the Micra can feel a bit overwhelmed when the going gets steep. Still, at least there’s not a great deal of weight to pull around. 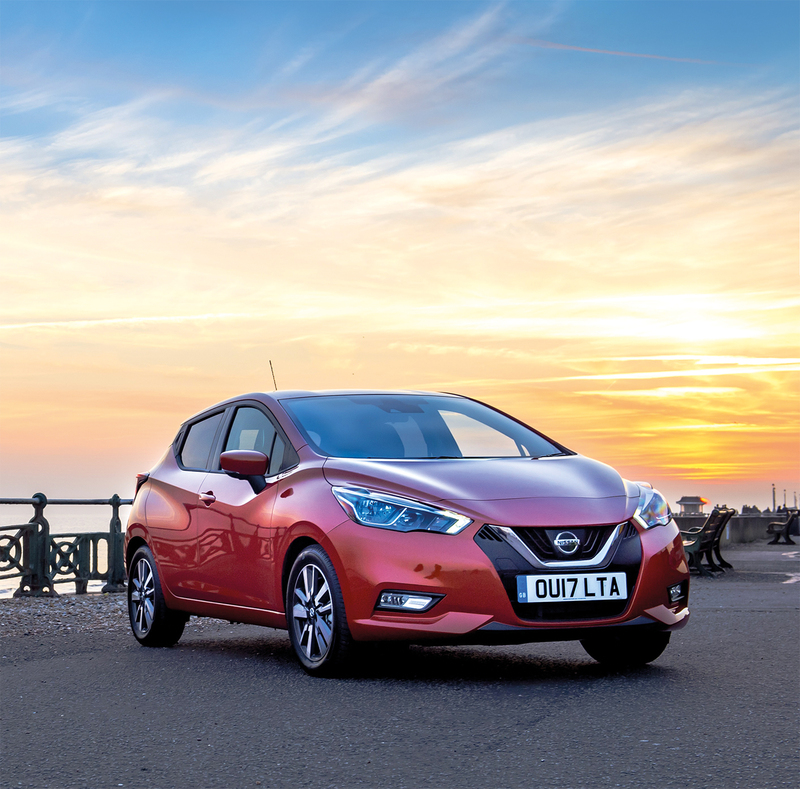 In fact the Micra feels, dare I say it, quite sprightly around both town and in the twisty bits – the five speed gearbox has easy action too. The driving position and visibility are also nicely judged and overall the Micra is pleasing, if not always what you’d call engaging to drive. It doesn’t feel outclassed on the motorway either. Although its featherweight does make it quite susceptible to side winds – as we quickly found out one particularly blowy evening on the A55 at Pentre Halkyn. You’re probably not going to buy a Micra if your sole intention is the high speed airport-run, even if its boot is more than capable of swallowing a couple of suitcases. Whilst it is a pretty capable all-rounder, and it’s well-equipped: Bluetooth, Apple car-play, NCAP 5 star safety, air-con, cruise, auto-dipping lights, stop-start, lane departure warning, 7” sat-nav etc. etc (although rear seat passengers still get wind-up windows!) all put in an appearance on this xrange topping Tekna, its natural habitat like many a supermini, is in town where its comfort-biased ride does a sterling job of soaking up the majority of the bumps. In places the Micra does feel a tad expensive – and especially so if you load it with extras (our car was just shy of £20k). But, it is stylish, it is pleasing to drive, it is practical, it is economical, and being a Nissan it promises to be reliable. A Polo feels stronger, a Fiesta more entertaining, and as mentioned before, there’s a whole host of competition these days that never used to be there. That said the Micra somehow feels right. If you’re looking for a supermini it’s time once again to take a good look at the Micra. Many thanks to Natasha and Lindsay at Nissan’s press office for the loan of the new Micra.